Posted February 25, 2014 by Eric Graham . I’m sure you’ve seen the ads – take this miracle pill and you’ll lose 20 pounds in two weeks without diet or exercise! And while it’s certainly appealing, anyone who has ever tried a fad diet or pill can tell you they don’t work. A juice cleanse may get you five pounds thinner but chances are you’ll pack it back on in no time. There is no magic bullet, no shot in the arm, no quick fix. Sustainable weight loss requires a commitment to changing your lifestyle. The same is true of marketing. When you’re hurting for customers, throwing out deep discounts and coupons might bring people through your doors, but do those customers come back? Most likely, they’ll wait until you throw out another discount before they return. Are those the kind of customers you want? Or do you want customers who understand quality is more important than price, who come back to you time and time again, who refer their friends and family to your business? Marketing that produces results requires a commitment to changing your message. 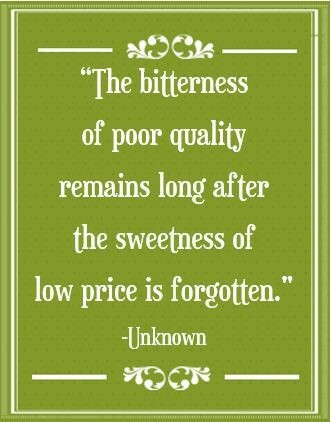 Stop teaching your customers (and yourself) to value price over quality of service. An American Express survey shows that 70% of customers will pay more for better service and 59% of consumers will try a new brand if that brand promises good customer service. Instead of focusing your marketing on price, focus on what’s in it for the customer. Why should they do business with you? What benefit do you offer over your competitor(s)? This will weed out bottom-feeding customers only after the best deal, attract high-quality customers, and grow your business the right way. To get real results, to create long-lasting relationships with your customers, to be successful, you have to change your marketing. Contact AMG today and get a free assessment of the marketing you’re currently doing and a plan to grow your business this year.